This week's BBQ Review takes us to Chapel Hill, North Carolina to sample The Pig, where they feature "whole hog BBQ." Chapel Hill is best known as the home of the Tarheels. Laid back and uber preppy, Chapel Hill is a small town that is always bustling with activity. College students are everywhere, and that can be a very good thing or a very bad thing, depending on what you're looking for. In February, I went with my parents to sell some old silver in Greensboro. My dad, continuously looking for ways to improve his competition BBQ, has heard tale of The Pig several times, so we decided to make the drive a little longer and check it out. The Pig is located along a winding wooded road in a strip mall. Very unassuming with just a few tables, there is a standard menu and several specials written on a chalkboard. Drinks, utensils and seating are all self-serve. We were in late on a Saturday afternoon, and there was a steady trickle of patrons. The mix was families and couples, not too many of the college students I mentioned earlier, perhaps due to it's location further away from campus. Depending on where you go and whom you ask, BBQ has several definitions. My liberal definition is the way in which the meat is cooked and flavored. However, it seems as if The Pig has interpreted BBQ to mean pork. Granted, the restaurant's name is The Pig, but I was expecting more variety. To their credit, they do offer beef brisket, fried chicken and the always-unappealing tempeh. When I eat BBQ, I prefer chicken or tri-tip. Fried chicken was too heavy, considering I had my eye on a fried option. No worries for me, as any BBQ restaurant can redeem their lack of meat variety with SIDES! With no choice of meat, I was left to choose between a considerable collection of side dishes. 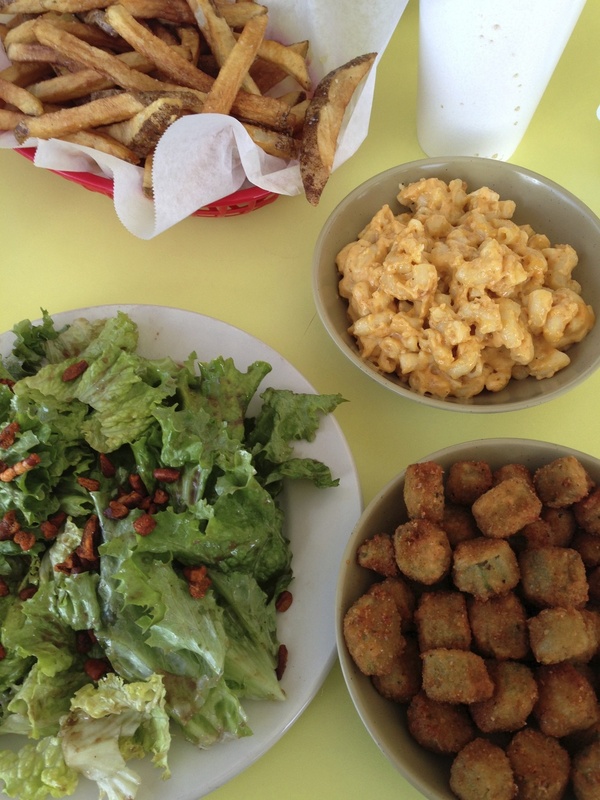 I ended up choosing the side salad, macaroni and cheese and my all-time favorite, fried okra. So you may be thinking "side salad?" It wasn't an ordinary salad. It had chopped nuts that were dusted with their BBQ seasoning! In fact, almost everything I had at The Pig had an essence of their slightly sweet, slightly bitter BBQ seasoning. It worked wonders in perking up an ordinary salad. The dressing was vinaigrette, which also paired nicely. 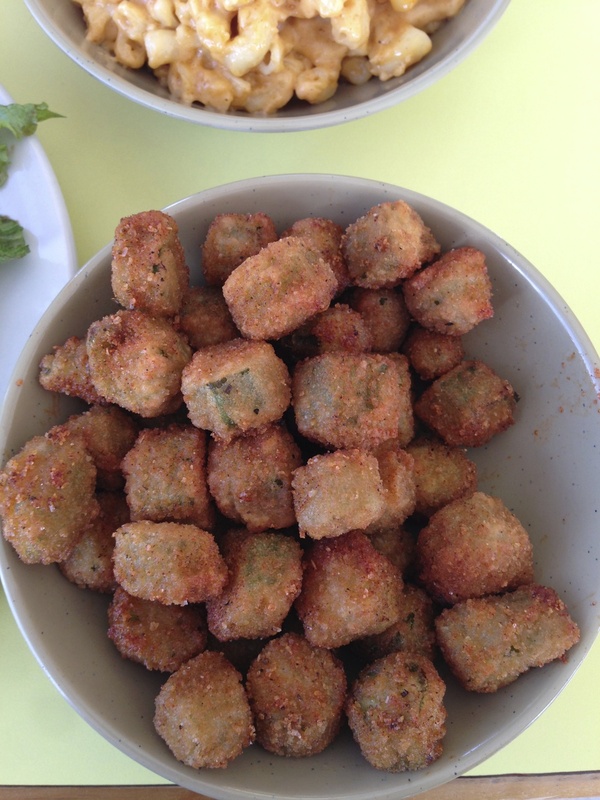 The fried okra also had the BBQ seasoning. Okra is one of my food passions and people have a tendency to burn it. Not here. It was perfect, hot and the seasoning still makes my mouth water. If you're looking for variety in meat, The Pig is not for you. However, it's always nice to find surprises and The Pig delivered in their selection of sides. If you're in Chapel Hill and looking for a relatively cheap meal that will fill you up, The Pig is worth a shot.